Our uPVC Casement Windows contain Synseal’s industry leading design, bringing effortless functionality to a proven design. Select Products offer a comprehensive range of uPVC casement windows from Synseal‘s SynerJy range. This means that when you have uPVC casement windows installed by us you will benefit from an industry leading product as well as first class workmanship and service. The SynerJy range offers a uniquely structured internal design, developed to mirror traditional window features. This gives all SynerJy casement windows the advantage of industry-leading high-performance internal systems, while still blending seamlessly into the character of your home. 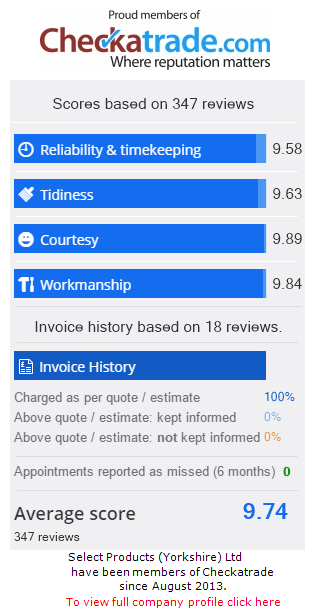 Select Products supply and install our stylish range of double glazed windows in Leeds, Bradford, Harrogate, Wetherby, Horsforth, Pudsey, Otley, Ilkley and Yeadon, and our outstanding quality is backed up by many positive Checkatrade reviews in these areas. Choose from our extensive range of double glazed windows. Our aluminium, timber and uPVC window collection boasts a stunning range of window styles. Whatever the style of your property, we are confident we have the right windows for you. Select Products has many years of experience installing quality windows in Leeds and West Yorkshire. As a result, we have gained an excellent reputation. Our professional and skilled team of window installers will provide you with an exceptional service, and our cost-effective range of casement windows means we have the perfect option across all budget ranges. Improper window installation from inexperienced fitters can often cause a wealth of problems for home owners. These issues can range from minor draughts or leaks during severe weather, to more serious potential structural issues. Our team of highly experienced installers have a breadth of casement window installation knowledge, so your home is always in safe hands with Select Products. We only install the most energy efficient casement windows that contain Low E argon filled Planitherm glass to minimise energy loss from your property. This expertly engineered glass will allow solar heat to enter in through your casement windows to heat your home, without warmth being lost to the outside. The excellent insulation that these casement windows provide could not only improve your property’s energy rating and save you money on your heating bills, but it could also lower the overall carbon footprint of your property. This means retaining your home’s heat not only has cost-efficient benefits for you, but is benefiting the environment too. We specialise in the installation of energy efficient double glazing. We offer a wide choice of styles and colours to tailor to the style and character of your home. Our uPVC casement windows are internally glazed for extra security. We are a BFRC registered company. Our uPVC frames are available with an attractive choice of colours and factory finishes that will give your property an elegant and sophisticated façade. Add a sleek touch of style with classic sparkling white or opt for a more traditional appearance with a choice of three woodgrain finishes. The classic design of our casement windows gives them a timeless style that has lasted throughout the decades. Our uPVC casement windows are also available in grey, black, red, blue and green for homeowners looking for something that little bit different. Combining these colours and finishes with our extensive range of decorative options, such as sash horns and Georgian bars, means that you can find the perfect casement window to complement even the most unique of properties. To ensure that your home gets as much natural lighting as possible, our casement windows are designed with lower sightlines to increase the area of visible glass. Not only does this assure that your windows are making your home as bright and airy as possible, but it also provides a larger area to take in the views surrounding your property. SynerJy uPVC casement windows from Select Products are manufactured from polymer materials and are specially designed to withstand the unpredictability of the British weather. They are made in the UK and meet British Standards BS EN 12608-1:2016. These high specification standards ensure that your windows will remain both noise and weather-protected for many years to come. The multiple internal chambers incorporated into our casement windows act as inner support structures, providing our windows with a high base security. This, combined with our premium-grade uPVC materials, will give your windows a heightened resistance to impact and leave you confident that your home will always be defended from would-be intruders. All our casement windows are developed with high security, multi-point locks to ensure maximum protection throughout the entire window frame, leaving no exposed locks vulnerable to attack. Once our windows have been installed into your home by our highly trained, expert team of fitters, you will be left with no doubt that your property’s windows are safe and defended. Our uPVC casement windows are built to last, and you can rest assured they will not rot, warp or rust. You can stay confident in your investment knowing that our casement windows are covered by a full 10-year manufacturer’s guarantee. The excellent quality of our windows means they will remain as elegant as when you first bought them, throughout their lengthy life-span. You can also benefit from extra free time as they are low maintenance, meaning you can wave goodbye to the chore of painting your windows the day they are installed. Once your home is equipped with our high performance, low upkeep casement windows, only the occasional clean is needed to allow their simple, classic style to enhance the existing appeal of your property. Browse through our exceptional range of windows using our online quoting engine. It’s so easy to use, and you’ll get an instant online price. For further information and technical advice regarding our uPVC casement windows, please contact us on: 0113 257 8933. Alternatively, use our online contact form and a member of our friendly team will get back to you.